The first step of the process is getting your laptop keyboard of choice connected up to the Teensy, but as you might expect, that’s often easier said than done. They generally use a flexible printed circuit (FPC) “ribbon cable” of some type, but may also be terminated in any number of weirdo connectors. [Frank] goes over the finer points of getting these various keyboards connected to his PCB, from searching the usual suspects such as Aliexpress and Digikey for the proper connector to throwing caution to the wind and cutting off problematic nubs and tabs to make it fit. 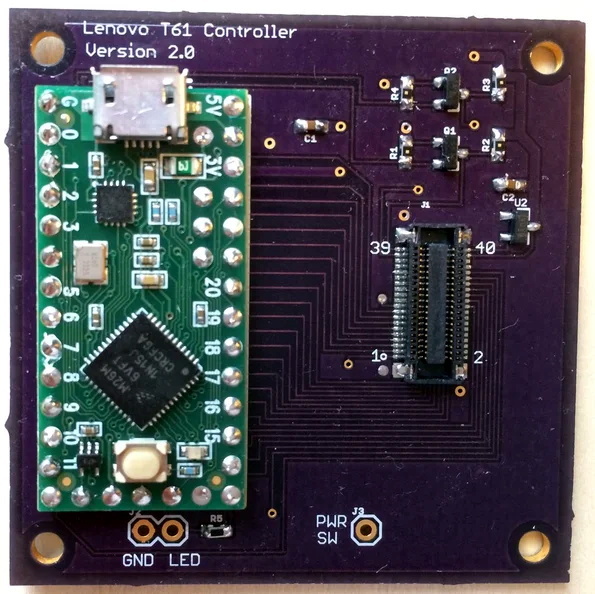 You might be on your own for figuring out the best way to connect your liberated keyboard up, but [Frank] has done his part by designing a few PCBs which handle routing the appropriate connections to the Teensy LC or 3.2 microcontroller. He’s such a swell guy he’s even written the firmware for you. As of right now there’s currently a dozen keyboards supported by his software and hardware setup, but he also gives tips on how to get the firmware modified for your own board if you need to. It should come as no surprise that it was a Thinkpad keyboard that got [Frank] going down this path; as we’ve documented over the years, hackers love their Thinkpads. From fitting them with more modern motherboards to going full on matryoshka and putting a second computer inside of one, it’s truly the laptop that launched a thousand hacks. You can buy Thinkpad keyboards with USB plugs ready to go on Amazon for $75. Most people that are interested in this project are interested in the classic 7 row keyboard. Hmmm, enter key stuck on that k/b? My ThinkPad X61 (I think that was the model #) was my favorite keyboard! The new keyboards drive me crazy because they are so shallow! I’d live to have it as an optional keyboard. Great hack! Yeah, there was a Sci_Fi movie about a spaceship computer that had one of those keyboards. A future project that I have been pondering for a long time now.. is it a tablet, is it a laptop, is it a phone? Yes, it’s a modular “all of the above”. Anyway… one of the things I have been unsure about is the keyboard. Building (a good) one from scratch could get EXPENSIVE! Maybe this is the answer! Is it? The only thing I am left wondering about is the Teensy. Those are pretty powerful right? Does that mean they are also power hungry? How is the power consumption on this thing when considering it as part of a battery operated portable device? Yah, I know, I could Google it. But.. to really do the job right would require researching the Teensy AND dozens upon dozens of alternative devices. Also, it’s not just a simple matter of looking up what their ‘normal’ current draw is. It would require researching power saving techniques and what power saving features are available on each chip. I bet someone here already has a lot of experience in this field. I bet somebody can just say, Teensy Yes or Teensy No and I can do the research of Teensy How at a later date if this project ever gets off the ground. I don’t have a “Teensy Yes/No” answer for you, but Craigslist often has non-functioning Thinkpads listed for sale, if you need to source a keyboard. Teensy LC running at the full 48 MHz speed without any low-power effort (like the Snooze library) consumes about 13 mA. If you drive pin 13 high, the orange LED adds ~3 mA. I was thinking about a DIY laptop too and the Keyboard, Screen, and Trackpad were the only things stopping progress because of the proprietary connectors and drivers. Maybe all we need next is a DIY Trackpad to finally usher in a generation of awesome DIY laptops. Screens would be nice too, but it might be possible to just hack an existing monitor with a hinge and 3D printed case to make it work. All other component are ready to go off the shelf, especially with the Intel NUC style boards. Nice, well I can design the battery pack for it using battery clips and 18650 cells. I think we’re almost there! I just created a 3D CAD tutorial on how to design your own product starting with creating a DIY laptop using product life management. Maybe we can collaborate to finalize a quality Open Source laptop design using existing hacks. If there’s demand, more episodes to come. This is great to see, I’ve been working on my own version for a bit now, but I’ve ordered the pieces to build this. Will see how it goes. wasnt EC disassembled already anyway? Lenovo actually makes and sells USB keyboards that look just like that one from article picture, TrackPoint and mouse buttons included, of course with housing. Nevertheless, featured project is cool as it can make practically any laptop or non-USB keyboard USB compatible. No, actually, they don’t. They haven’t sold that keyboard layout since 2011, excluding the insanely overpriced Thinkpad 25. That’s the whole reason why he had to go through this to get that keyboard in a USB form. Because of my preference to the key layout of the older Lenovo/IBM lappies this beats the readily reusable Dell E6440 keyboard hands down. The E6540 has a number-pad though and readily connects to the EC via a PS2 compatible bus from a little PCB under the keyboard. I would love to have these keyboards in my newer Thinkpads. One might wonder what has gotten into the Lenovo designers with the new keyboard. The best has become worse. The SK-8855 Thinkpad USB keyboard with the old-style keys and layout is no longer in production. As a result, it’s quite rare, and those that do pop up are expensive– prices generally start at 150 USD. > One might wonder what has gotten into the Lenovo designers with the new keyboard. The point of the six-row keyboard is you get more room for a bigger trackpad. I don’t care about the trackpad but that’s the reason I’ve seen Naitoh-san say. I bought an “As Is” Lenovo Thinkpad T61 laptop for $10 from my local PC recycling store (repc.com) and used the keyboard for all the development of this project. Out of curiosity, I put the keyboard back in the laptop and fired it up and the laptop still worked great. I didn’t have the heart to part-out such a great laptop so I gave it to my daughter as an early Christmas present. I’ve gone back to the recycling store multiple times but no more Thinkpads. I ended up purchasing a Thinkpad keyboard from Green Penguin on EBay for $11. In the Instructable page, [Frank Adams] mentions that he built a mobile KVM for a friend using a laptop with a dead system board as a base. Put an LCD controller board inside, and converted the keyboard and touchpad to USB. I’ve been planning to build one using the carcass of an ancient Thinkpad, so this project makes it much easier to do so. Next step, replace the USB with bluetooth so you can finally type properly on a tablet. For those not intimate with Thinkpad model numbers: the most famous is the 701C series, from 1995. That’s the version with the “butterfly” keyboard.